For all you plan-aheaders out there, my "Valentine's Day Confection" post is coming a little late...but for my fellow fly-by-the-seat-of-our-pantsers, have I got the recipe for you! 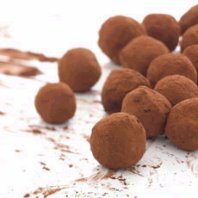 These CHOCOLATE GOAT CHEESE TRUFFLES taste complex and difficult - and are a snap to throw together! I know, depending on which camp you're in, you're either thinking "Why would you adulterate chocolate with goat cheese?" or "Why would you ruin goat cheese with chocolate?". But - trust me, folks - the combination (along with the magic catalyst, lemon extract) is impeccable. Be forewarned that as is, this recipe is not too sweet and can be very grown-up tasting; feel free to add extra sugar! I also like to dust them in powdered sugar after the cocoa; it gives them pretty little spots and makes them yummier. In a metal bowl set over a pan of barely simmering water melt the chocolate, stirring until smooth. Remove bowl from pan, and let chocolate cool slightly. In a bowl whisk together goat cheese, confectioners' sugar, vanilla, and lemon extract until the mixture is light and fluffy. Whisk in the chocolate until the mixture is combined thoroughly. Chill the mixture, covered, for 1 hour, or until firm. 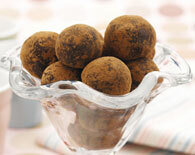 Form heaping teaspoons of the mixture into balls and roll balls in cocoa powder. Chill truffles on a baking sheet lined with waxed paper for 30 minutes, or until firm. The truffles keep in an airtight container, chilled, for 3 days. Love your Blog. Love you. Don't care much for chocolate or goat cheese, but these are great! Dad. Interesting concept chocolate and goats cheese I can almost see how it works! This recipe sounds intriguing. I'll have to let my dad know since he's both a fan of chocolate and goat cheese. Sending you and all your truffle loving friends happy wishes for Valentine's Day. Keep writing! Oh, and I must have Lex over for dinner next time the two of you are home. We'll have chicken soup and carrot cake. :)...I love that girl!